The cool Adriatic breeze tousles my hair as I cycle the costal paths and cobbled streets of Puglia. 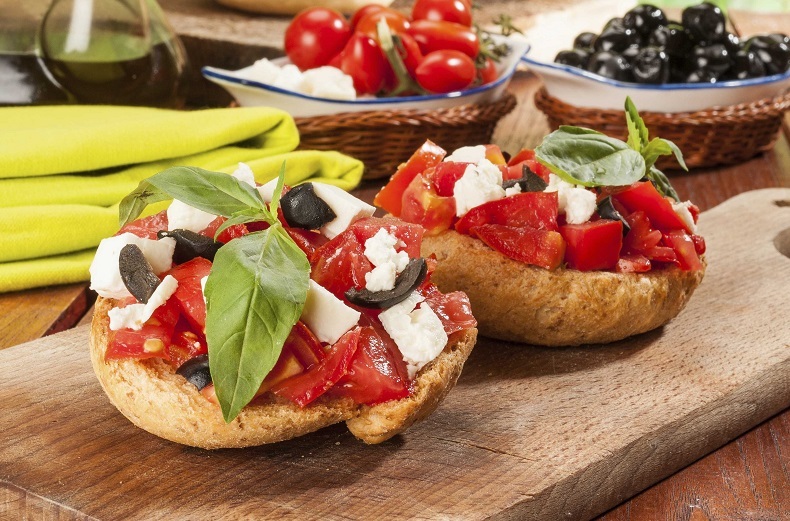 The sun-drenched heel of Italy’s boot is rich in history, culture and cuisine. 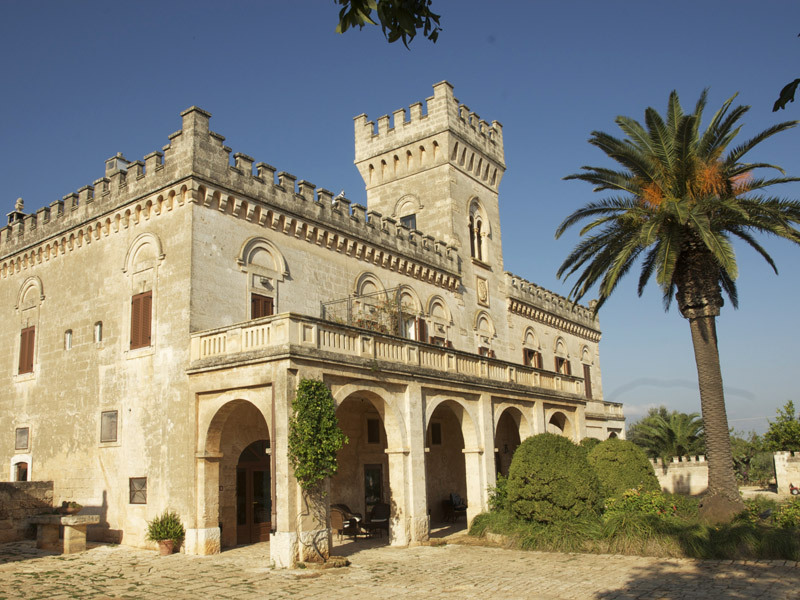 I take in Baroque cathedrals, Roman olive plantations, fortified towns and vineyards on my ‘Contrasts of Puglia’ break with self-guided tour operator Headwater. The company started life at the kitchen table of Richard and Christine Bass, back in 1986, with a modest portfolio of three walking and canoeing holidays in the Loire Valley. Some 32-years later, the couple have retired but have retained many staff members from the early days. Their aim is to provide holidays which encompass an authentic experience in a European region, including stays in family run hotels, fine wines and excellent cuisine, all in an independent but supported way. 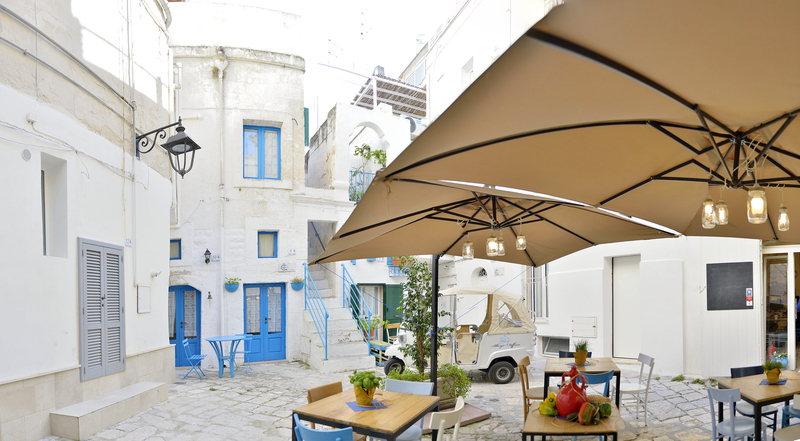 I spend the first night of my trip at the Alberto Diffuso Hotel, a lovely property that has rooms dotted around the tiny historic centre of the town of Monopoli. I arrive at my accommodation via the hotel’s tuk-tuk, bumping through sun-drenched, cacti-lined streets. The room’s high-arched ceilings and sea-view terrace feel like they have been woven into the historic tapestry of the area. The low, fertile fields of the Puglian coast make for pleasantly inclined cycling. At the same time, an amazing selection of fresh, seasonal fruit and vegetables is on offer. I visited in the winter and enjoyed an abundance of artichoke, creamy aubergine and the sweetest carrots I’ve ever tasted. Tomatoes were off-season during my trip, but the candied cherry tomatoes of Cibando, a “fast food” restaurant in the picturesque walled-town of Martina Franca, were to die for. Served in home-made tacos with local cheese and capocollo, the dish encapsulates the restaurants ethos – quick to serve with local high-quality ingredients and a youthful twist. Whitewashed buildings sit atop the craggy cliff edge in Polignano a Mare, while balconies jut out providing stunning vistas over the Adriatic. The narrow, sun-bleached streets of the historic town are filled with local musicians. 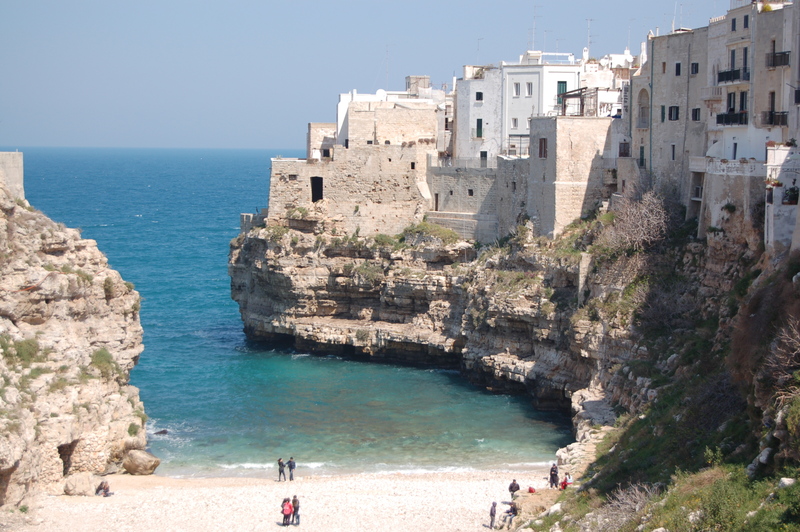 Polignano a Mare also boasts a Blue Flag beach, but there are plenty to choose from in Puglia. Our cycle tour took us past Savelletri - a fishing village with ample high-quality restaurants and spots to swim. The region is famous for the tiny, conical roofed trulli, or huts, dotted throughout the picturesque fields. Built in this style to be easily dismantled should the tax collectors visit, the town of Alberobello boasts 1,000 such buildings and has been designated a UNESCO World Heritage Site. I stayed in one which had been modernised with creature comforts – a far cry from the peasant accommodation for which they were originally intended. 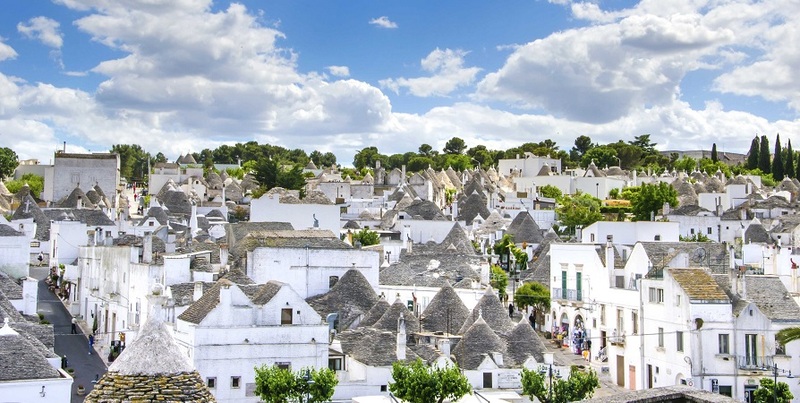 For more information, Trullo Sevrano is a rare two-storey trulli, built by a wealthy priest in the 17th century, and it now hosts a museum to trulli life. Just across the road sits Trettoria Terra Madre, a field-to-fork (or ‘della terra ala tavola’, as the Italians would say) restaurant that grows and cooks all of its own organic produce. It’s a great example of a millennial-led enterprise, the likes of which are cropping up across the region. Guests will here find a celebration of the local and traditional, ethically packaged, and presented with the high standard of hospitality that seems to come naturally to Puglians. My cycle tour is guided by the app ‘Ride with GPS’ which maps out every turn and point of interest along the route. With easy-to-follow instructions inputted, tried, and tested by Headwaters reps my route takes me to Martina Franca, a gorgeous town with incredible views across the Itira Valley. Here seas of olive and almond trees are interspersed with the occasional massaria (fortified farm). On of the highlights of the trip was an invitation to go olive oil tasting at the historic Massaria Brancati which has buildings dating back to the late middle ages and a plantation with its roots in Roman times. Many of the trees have been designated national monuments for their beautifully twisted, gnarled appearance and for their agricultural and scientific significance. Corrado Rodio, the massaria’s current caretaker, showed us around the grounds and introduced us to trees that may be as much as 4,000 years old and are still producing olives. With the threat of the Saracen pirates from the Adriatic and valuable stores of olive oil to protect, there are plenty of massarias dotting the Puglian landscape. I spent my last night in the beautifully maintained Massaria Salamina, a 17th century farm house, lovingly converted by the Miccolis Angelini family into a 20-room hotel. It was at once ornate and homely: Puglian hospitality abounds here. Eleanor travelled with Headwater whose ‘Contrasts of Puglia’ cycling holiday costs from £1,179 per person, tour only. The trip is offered on selected departures on Mondays and Wednesdays from March 28th this year until October 18th. The holiday includes accommodation in high-quality hotels, all continental breakfasts and three evening meals, luggage transfers, high-quality bikes with Ride with GPS route directions. Flight inclusive prices from £1,399 from London Gatwick to Bari airport, with regional airports on request.